There is an old saying “Be careful what you ask for because you just might get it.” The meaning being that there are sometimes hidden side-bars or responsibilities that you don’t consciously think of when wanting something. Well, in a way we have realized that result here at the Museum. For so many years we struggled with no permanent place to call home and very little publicity as to what we were trying to accomplish. However, in the last few years that has dramatically changed, and there is a “side-effect” (albeit a positive one) that I would like to discuss here. After moving into the old Highland Park Station, which provided a permanent place to acquire and display the history of the Department, we have experienced a significant increase in publicity regarding the Historical Society and our projects. As a result , requests for tours and to use the property as a meeting and training venue and offers to donate historical items have risen incredibly. Through the courtesy of our friends at the L.A. Police Federal Credit Union, the Protective League, the Retired Fire and Police Association and even Jack Halstead’s Retired News Letter, personnel have been made more and more aware of our efforts. The annual Jack Webb Awards have involved a lot of Department employees through the years, but the recent phenomenally successful “Night With Joe Friday” honoring L.A.P.D. detectives has reached even further into all levels of the Department and into those who have retired to show them what we are doing and to even further ignite the growing interest. Front and back design of the new LAPD Detective Coin, whichwas designed by active duty LAPDDetective personnel. A crowd of 1,500 gathered to celebrate the first annual Night With Joe Friday – A Tribute to LAPD Detectives at the Museum on November 22. The evening included a gala awards ceremony, celebrity author appearances, a BBQ dinner, door prizes and entertainment by Copper Creek Band. Several blocks of York Boulevard were closed off to accommodate special displays of vintage police vehicles and exhibits. Two huge tents were set up behind and beside the building to provide a dining area and entertainment hall. The cellblock was transformed into a book signing arena. Joseph Wambaugh, Steve Hodel, Paul Bishop, Keith Bushey, Stephen Downing, and Dallas Barnes autographed their work and chatted with readers. Chief of Detectives James McMurray opened the awards program followed by an invocation from a local Pastor, A. J. Mora. Speakers included Chief William Bratton, LA City Councilmember Antonio Villaraigosa, LAPM Executive Director Dave Dalton and LAPM Board Chairman Thomas Hays. A highlight of the show was the unveiling of the new Detective coin. The logo was chosen in a recent contest open only to detective personnel. The winning design was submitted by Det. Jose DeLeon. All detectives in attendance were presented with sparkling new brass coins at the end of the evening. Chiefs Bratton and McMurray presented the Area Hat Squad Detective of the Year Award to Detective II James Willis, West LA Division. Detective III Jack Giroud, Robbery-Homicide was recognized as Specialized Detective Division Hat Squad Detective of the Year. These awards were named in honor of the “Hat Team” Detectives who worked Robbery Division under Captain Jack Donahoe. He required his detectives to wear a hat as well as a suit. The men began to wear their hats regularly—even inside the office—and set a standard of excellence for future officers. The Ray Pinker Forensic Specialist of the Year Award was given to Clerk Typist Zella Baker, 77th Detective Division. This prize honors a civilian employee who embodies the dedication of the esteemed Chief Forensic Specialist who developed the LAPD crime lab. A special exhibit showcasing Pinker’s 36-year career is currently on display at the Museum. His widow and children attended the event. The evening also marked the debut of the North Hollywood Shootout Exhibit. Displays include weapons, body armor, a bullet-riddled police cruiser, photos and artifacts capturing the drama of the harrowing 1997 bank robbery and its aftermath. Items have been donated to the Museum as a permanent memorial to all who were involved in the incident. A portion of the proceeds from the evening will help fund the Museum’s planned new Fallen Heroes Tribute exhibit. The Historical Society has partnered with Consumer FIRST, a national financial marketing company, to provide benefits to our members while gaining contributions to help us with the ongoing needs of the Historical Society. When our members register their existing VISA or MasterCard through the Los Angeles Police Historical Society’s website they are eligible to receive a portion of their purchases (up to 2.5% on EACH purchase) as a refund on their next credit card statement. Every time a member shops at the hundreds of participating online or “brick and mortar” merchants, they will receive a refund, and an additional portion will be sent to the Historical Society. the amount of refund you will be receiving. And if you are concerned about conflicting with your other credit card benefits such as mileage programs, don’t be. The Consumer FIRST program “supercharges” your credit card, does not alter your existing benefits or the contribution to the LAPM. It’s only necessary to register your cards once, which will enable Consumer FIRST to get your refund to you on your NEXT credit card statement. We hope you will visit this new website and register your credit cards. 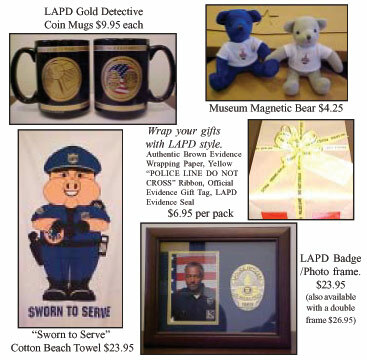 Your participation means you will be able to receive your refunds while shopping and at the same time help us obtain the additional dollars which will allow us to continue to make the Los Angeles Police Museum and Community Education Center a place in which you can take great pride. The L.A Police Historical Society and the L.A. Police Revolver & Atheltic Club have partnered to install two distinctive brick tributes to LAPD personnel. You can purchase an inscribed brick to commemorate your career as a police officer or to honor anyone else. 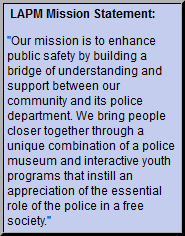 This contribution also helps the expansion of the LAPD Museum. donation. If you’d like to add your tribute to both sites, a second brick can be ordered for $50. Each rust colored brick is 8″x4″x2″ with black, block print letters. You can specify one to three lines of print with up to sixteen characters on a line. (A space is counted as a character.) Letters are ¾” in height. Donations for the commemorative bricks are tax deductible. Log on to www.LAPHS.org for an order form or call (323) 344-9445 for more information. Most people view retirement as a period in life when you finally get to relax. For Charles Hall retirement has a whole new meaning—he sees it as a new beginning. As an active volunteer member at the Los Angeles Police Museum, Charles gives tours five days a week. But not just any tours. His tours are filled with exciting tidbits from a life filled with interesting experiences. Charles was born in Seattle, Washington, on May 3, 1935. He grew up in a logging community on the western side of the Cascades where his father owned a logging company. In 1950, the timber industry was slowing down in Seattle, and they moved to Arcata, California. The next year, Charles, his father, mother and younger brother moved to Highland Park. Early in 1952, he met his wife-to-be. On July 18, 1953, Eileen and Charles were married. He worked at Lockheed Aircraft in the painting department. “One of my most interesting periods of time there was from ’53 to ’58 when I worked on the airplane being built for President Dwight D. Eisenhower,” Hall recalls. For the next 22 years he worked for Van Lyon Moving and Storage. He helped move famous stars like Frank Sinatra, Cary Grant, Lucille Ball, Bob Newhart and Jack Benny. Charles made two very close friends during that time: Sgt. Norman Moore and Irving Kasper, both homicide detectives. Kasper’s father-in-law was Thad Brown who became Deputy Chief to William H. Parker. Brown had been the head of the detectives for many years. “He was renowned of all detectives,” Hall adds. When Parker passed away, Brown became the interim chief of police, then he retired. He worked the Highland Park Station [now the LAPM Museum]. Charles continued working with Moore and Kasper doing consultation. “I was giving speeches about the American Civil Liberties Union and how they were trying to undermine law enforcement,” Hall says. In 1997, Charles retired and became a basketball coach for Hillside Baptist Academy then he went on to become the Athletic Director of Sycamore School, his granddaughter’s junior high school. He now helps coach a basketball camp sponsored by West Coast Baptist College and serves as a school board member for Grace Baptist Academy in San Gabriel. About a year ago he was invited to become a member of an organization called CLEAR, per Kasper’s recommendation, to report on graffiti, drug and gang activity in the community. He also became a volunteer at the LAPM Museum & Community Education Center. of Directors which helps guide the policies and future growth of the Society but there is also a great need for both active and retired employees, both sworn and civilian, to give some of their time either as docents or to work on committees for specific projects, to catalog historical items and a myriad of other things. We even could use an individual to act as Volunteer Coordinator to maximize their use. It’s a great way to “kill some spare time” and you even get to hang out with some old friends and a great group of people, the L.A.P.D. both past and present. detective friend Moore,” Hall says. “I tell visitors about the famous `fly detectives.’ Two homicide detectives saw flies swarming around a wall and decided to break through it. On the other side there was a rollaway bed with the decomposed body of a dead woman they were looking for.” Those two detectives were Kasper and Moore. Charles continues to keep busy in his retirement years. Recently, he finished a course at UCLA that enables him to teach boiler safety and steam plant work at industrial training schools. Charles and Eileen have six children, four boys and two girls. Their son, David, is a bricklayer for historical landmarks and a professional surfer. He did some of the brick work for LAPM. The Halls live in Highland Park in the house where she grew up in the ’40s. They celebrated their 50th wedding anniversary this year and were presented with a certificate of congratulations from President George W. Bush at the grand opening of the Metro Gold Line in July. Santa Claus arrived in style! The Northeast Area toy distributionwas held at the LAPD Museum.Officer Marinelli picked-up jolly St. Nick in a police car and with its lights flashing and siren blaring drove him to the Museum where 450 kids eagerly awaited their gifts. Larry succumbed to injuries sustained in a motorcycle accident weeks prior. Larry was only the second Athletic Director in the entire history of LAPD sports. He left a rich distinguished legacy as a motor officer, athlete, coach, Athletic Director, father and friend. He possessed a rare capacity for living life “huge,” having fun and loving those around him. God bless you, Larry. We’ll miss you.